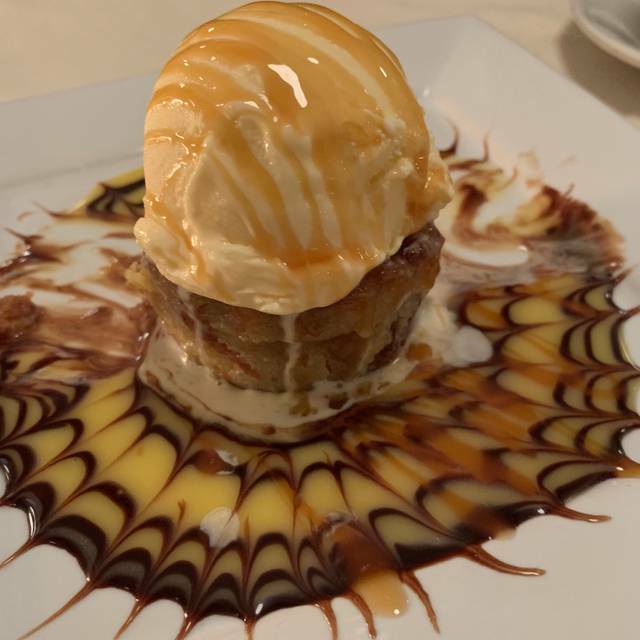 Rooted in a tradition of quality in Addison since 1992, Jaxx Steakhouse offers a variety of dishes from hand-cut steaks, fresh seafood to salads and pasta. We invite you to try our signature dish- Jaxx Pepper Steak, paired with a glass of wine or a martini in our classic, romantic dining area. We feature a full bar, daily specials, and a private dining room for private gatherings or larger events. Closed on Christmas Day 2018. Open on Monday, New Year's Eve 2018. Closed on New Year's Day 2019. Jaxx is the perfect venue for your next event. From business meetings or birthday parties to rehearsal dinners, Jaxx private meeting room can accommodate any event. In front, on the side, or in the back. Jaxx is available for full-restaurant buy-outs during Saturday lunch hours and all day Sunday for weddings, corporate functions and private parties. Our space can accommodate parties of up to 100 people. Our private dining room showcases the footprints of many legendary figures through a collection of memorabilia. From the legendary baseball player Micky Mantle to one of the greatest heavyweight boxers, Muhammad Ali have been with Jaxx through its history. Great food and service. Orange Roughy was perfection. Steak Medallions melt in your mouth. It’s on my go-to list when I need to impress. Great old style steakhouse. My NY Strip was a bit tough, but flavorful. Jaxx Steakhouse is our go to when we want to get away on "don't want to think to much" date. Our go to menu item is the Sampler. It is amazingly good and is a good fill for two people who do not eat large meals. The service team is friendly and attentive. The atmosphere allows us to slow down and enjoy each other. He normally gets a chicken entree which is a big eat since it comes with two pieces of chicken breast along with rice and veggies. She normally gets a fish entree. NOTE: It is not for a big eater. We are not fans of the desserts but that is a personal thing. I had high expectations of this restaurant and it didn't meet or exceed my expectations. First of all I had to wait 20 minutes before I was seated and yes I had a reservation. The service was horrible and if a customer is going to be charged an automatic gratuity of $32 the service should have been outstanding. Our waitress appeared to not have a clue she was not helpful and her customer service skills are at an all time low. I have received better service in Chilis. The salad seemed as if it had been sitting for a few hours and it was poorly put together I can purchase a better salad in the Walmart deli. Our appetizer wad given to us "cold" so we had to send it back. My husband ordered the parmesan crusted halibut but there wasn't any parmesan on it. I ordered a pepper steak with jack potatoes and that was a complete fail, the steak was tough the potatoes were bland and old. I spoke with a manager and I told her our concerns and she gave us a drink, wow really, we did not drink them and she should have handled the situation much different. Service recovery is not her strength. This was supposed to be a special night for us because we actually got engaged on Valentine's day two years ago. It was a complete disappointment!! The food was amazing, even for the Valentine's prefix menu. Although appetizer was like warm, the steak rolls are really tasty. The main course meals were delicious and the desert cheesecake was very smooth. We had reservations for Valentines day; decided to give this play a try. Showed up 10 minutes early for our reservation only to stand in the entry way for 20 minutes next to people that had been waiting for well over an hour. There was no hostess to be found and seeing the writing on the wall we decided to go elsewhere. Can understand a little bit of a wait; however it was quite apparent that they were overbooked and very overwhelmed. Not saying I wouldn't consider trying the restaurant in the future, just not without a solid back up plan in place. Did the Valentines Day thing. Got a TINY table about 10 feet from a girl with a keyboard who was in the corner. Very LOUD. Couldn't even carry on a conversation with my date. Staff was overwhelmed, we waited about 15 minutes before anyone even acknowledged our arrival. Our server tried, but it was her first day on the job!! What kind of a Mgr schedules that? When we finally got some attention, we watched as all the tables around us turned over. Except ours,we were still there, listening to the din that was the entertainment. She finally quit at 9:00. Our reservation was at 7:15 and we finally got out of there around 9:45.
the only good part was the food, which is always very good. Other than that I'll never do Val Day thing again. Five years ago it was wonderful, with a rose on the table (a booth! ), great service, etc. Not sure why that changed. I've been dining at Jaxx off and on for 25 years, going back to the days of Mickey Mantle, and this experience was totally out of character. I also noticed a definite downgrade in overall ambience and the clientele. The "classy atmosphere" is gone. No one even dresses up anymore. Too bad. I will return at some point, though, just to see if this was a fluke. Went for Valentine's Day. Made a reservation online and showed up right on time. We were not greeted at the door and the hostess was ignoring everyone at the door and setting tables that were not getting filled. People wanted to check in and the hostess just mumbled something about seating in order that no one understood. We and others were made to stand in the doorway for 25 to 30 minutes before getting a table even though we had a reservation. There were empty tables the entire time we were made to stand at the door. At one point I counted at least 6 tables that did not get sat while a large crowd of people who all had reservations were not told what was going on. They had a set menu for the night, the stuffed mushrooms only had 3 to share between 2 people. The Caesar salad was bland and had almost no dressing at all. The steak was decent but was about half the size of the other servings I saw come out to tables before us. This definitely was not worth the price we paid and came away with a horrible service experience. Will not return. We went there for our Valentines date night and although the food was good it was not great. My wife asked for her steak to be pink but not bloody, aka medium rare, it was presented bloody. Our sever was overloaded and we did not get water refills or our check in a timely manner. Normally, Jaxx is a favorite but this time they had a bad night. For $170 i got a bloody steak over some french fries. I asked my steak to be medium well and it came out rare. Dont know why they call them Jax potatoes if they are french fries. Such a horrible experience. What a debacle! We've been here twice before and loved the food. This time the food was good, but they seated us for a fixed menu and served three courses in 15 minutes. During that same 15 minutes, we waited for our first cocktail. After the entree, which was delicious compared to the wilted and flavorless shrimp appetizer, our server attempted to deliver our dessert with no offer of coffee. We BEGGED them to hold off on dessert, ordered wine, received our dessert five minutes later. Then our check, finally the wine. Shameful mandatory tip. A disgraceful process from a once top choice for our fine food. The food was okay, and wait staff mostly attentive. The bartender cannot make good classic cocktails. Even coaching him for the right mix of ingredients, he screwed up our drinks 3 times. We gave up. Drinks are ridiculously expensive here. The cost of dinner was anticipated, but $16 per jacked up Rye Old Fashions is absolutely ridiculous. Cherries and orange wedges do not belong in an Old Fashion. That’s a Manhattan bud. They had a shortened menu and charged and automatic gratuity regardless of party size. I understand that it was Valentines Day, but that should have been communicated when booking the reservation. Discouraged me from returning. We have been to Jaxx's many times in past as well we came to enjoy our February 13th meal for our Valentine's evening eve! The service was great by Rocco as he was very attentive to us during the meal. Our Food was excellent as we have always enjoyed at Jaxx's. We were very disappointed however when arriving and was greeted by a little gal who was dressed totally we felt below casual for this restaurant setting. She wore black tights/leggings/spandex type pants with checkered tennis shoes and to top with a flannel shirt! All other employees were dressed as usual as they have in the past. WE were pretty shocked to say the least by this Hostess who was greeting people at the door. This was not the same as in the past by others who have greeted us when arriving. Some what disappointed as we hope this is not the setting Jaxx's is now going to in the future to see the first person dressed this way to be greeted unlike the other times by others we have been greeted by. For fine dining she was not a good representative to see first when arriving there we feel strongly of. My rating would have been a 5 star but the hostess took two stars from this rating. Disappointed customer here this evening to see her parading around the restaurant as she was dressed so casual to be in Jaxx's as a hostess. Food was delicious. Like the atmosphere very much.... the "smallish" size makes it intimate and not too noisy. Would bring other friends to dine there. We went on Saturday night to celebrate my mother-in-law's birthday and it was fabulous! We all 4 had different entrees. Loved the food, the drinks, the staff and the atmosphere. It was a wonderful experience. You can’t go wrong with Jaxx Steakhouse! Thank you again! Once again a wonderful experience with Jaxx. We started with martinis which arrived filled to the brim and were well made too. They even made blue cheese olives for us. Delicious warm bread was served with butter. We only ordered entrees this time, and both of us chose Jaxx pepper steak with Jaxx potatoes and smothered in a delicious peppercorn sauce. Both of our steaks were done per our request, and were a generous portion and high quality meat. 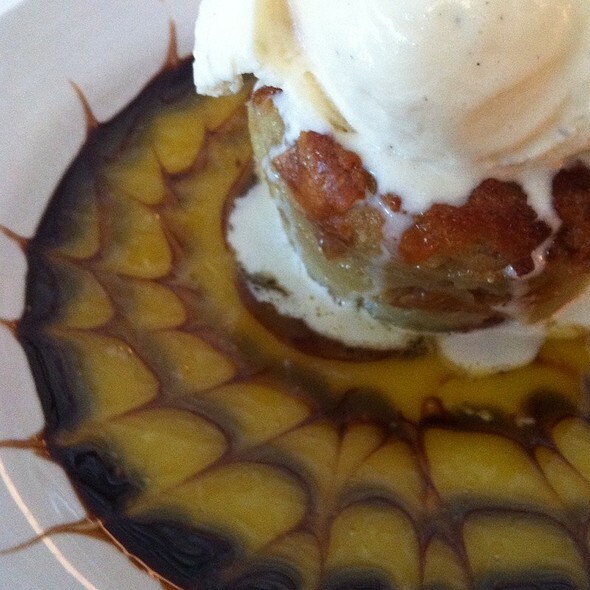 We ended the meal with the vanilla bread pudding served with ice cream. It was fantastic. We are repeat diners and have never been disappointed with anything. I forgot to get a pic of the entree, but believe me it was impressive. Really great food and dessert. A little pricey but worth it. The atmosphere was great! It was a little pricey, but overall a good experience. Food was done just right! We enjoyed ever minute of our meal. Very friendly and attentive staff. Were able to accommodate my food allergies. Food tasted very good. Nice portion size. Have been to Jaxx a few times and have enjoyed it each time. The ambience is great. Quiet, intimate dining. A step above a chain steakhouse without a huge bill. The portello mushroom is to die for, we eat the sauce with extra bread. We came in for the first time and were not impressed. 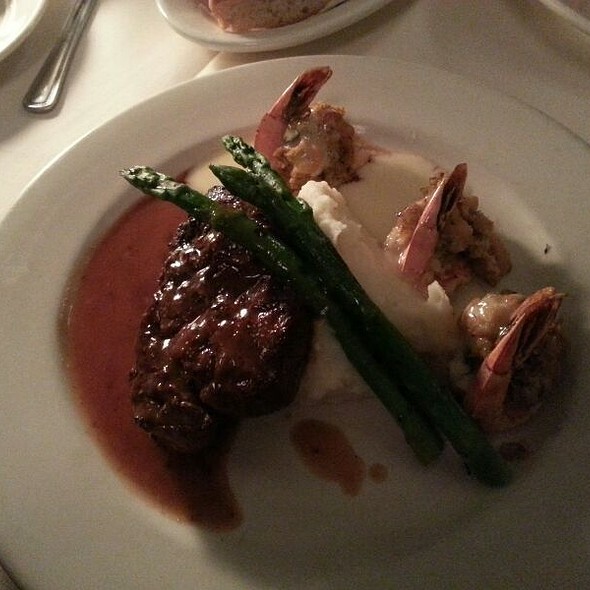 Two of us had the filet and stuffed shrimp. You'd think for the price there would have been more than only two shrimp. Just overall was not that impressed by the place. We'll give it another try to see if they can change our opinions. We've been regulars for several years and always have a wonderful experience. The food is delicious and the choices are many. The chef is amazing. The staff is always courteous and attentive. We always have great food and drinks at Jaxx, and this was no exception. We started with a drink at the bar before we went to our table. 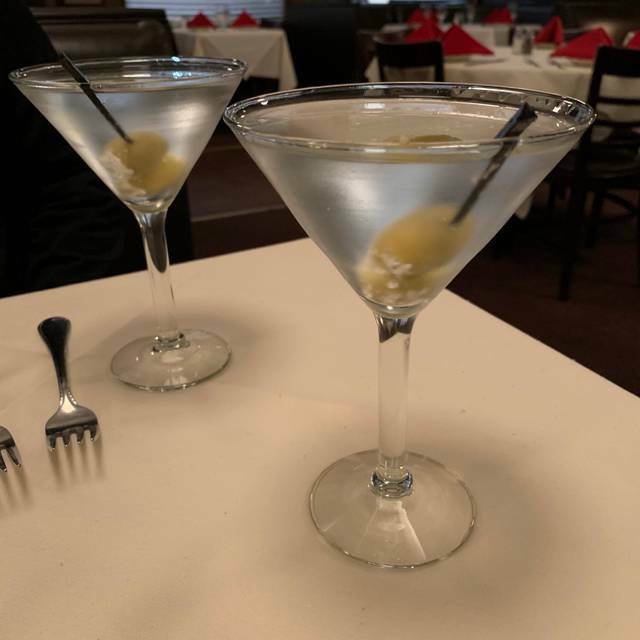 We both had a martini, which were perfectly prepared and a generous size drink. For dinner I had the pepper steak with Jaxx potatoes. Both were perfectly prepared and generous portion. My husband had the orange roughy with champagne sauce, which he pronounced delicious. We have always been completely satisfied with Jaxx. I always love Jaxx, think the food is great! Reservations at 8:15 was not seated until 8:48, and arrived before reservation time. Once we were sat at our table no service for nearly 15 minutes. Not mentioned until arrival that there was a limited menu and no substitutions for a bill of $240 for 2 people including the automatically added gratuity of 20% I did see the value at all. Will not be returning. Waited 1 hour despite reservation and once seated no server came till 25 minutes. Left the place! Very poor service and management! Overbooked themselves for new year's eve snd understaffed! usually a good place but expensive. seemed to be struggling with a particularly busy evening. ran out of baked potatoes during a 7:30 reservation seemed strange. usually a great place, just a very busy evening of new years eve. will return when able to take advantage of special discounts they run from time to time otherwise just too expensive. not a good experience this time, but know it is top notch overall based on previous visits. On open table it was not mentioned that, they have special fixed menu for New Year’s Eve for $65 per person. That was a surprise for us. Service was very slow even though restaurant was not very busy. We asked 3 times for bread and butter. He passed by multiple times but did not serve bread or butter. Finally I had to call manager for that. Also after one hour cold food was served. Cost of the food was very high compare to the quality of the food and serve time. Very good dining experience. The steak, fish and chicken dinners were outstanding and the sampler plate was huge and extremely good! The desserts were okay but wouldn't order them again. Great steaks, especially the pepper corn, delish key lime pie, and good service. Excellent restaurant. The steaks were great, and we enjoyed the atmosphere in the restaurant. We were happy to find such a nice place open on Christmas Eve. Since it was our first visit, we were not sure what to expect. We will certainly go back!